After subjecting migrant families to months of forced separation and reuniting parents and their children only under extreme pressure from the American public and a federal judge’s court order, Immigration and Customs Enforcement is now trying to coerce newly reunited families to leave the country, according to new court filings. The latest filing in the American Civil Liberty Union’s lawsuit against the Trump administration includes testimony from four fathers who allege that only a few hours after being reunited with their teenage sons in El Paso, Texas on July 25, they were pressured by ICE agents to drop their children’s asylum claims so that that their families could be deported together. Given a form by ICE agents that listed three options they could choose from—as Vox reported, “being deported with their children, being deported without their children, and waiting to speak to a lawyer”—they say that the first option had already been pre-selected for them. 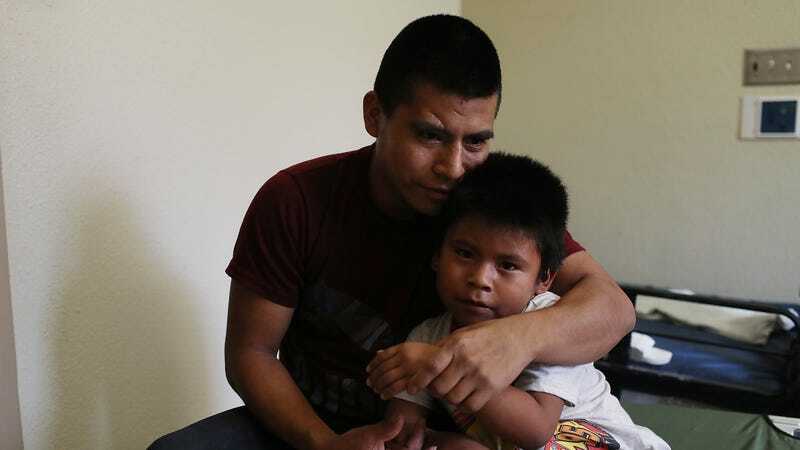 When, ultimately, the four fathers whose accounts are represented in the testimony succeeded in selecting the option of getting deported on their own, they were prevented from saying goodbye to their children. Instead, their children were forced to wave to them from inside the bus they were still sitting on. Lawyers and advocates have already alleged that ICE pressured parents, desperate to be reunited with their children, to agree to be deported, without fully explaining to them the ramifications of their decision and misled them into thinking that they would only see their children once they agreed to leave the United States. One of those stories is that of Lilian, an asylum-seeker from Honduras, who came to the United States with her five-year-old daughter Victoria. Lilian told The Atlantic that after she failed her credible-fear interview (one of the first hurdles one must clear in an asylum claim), an agent presented her with a deportation form. You can read the full report, including the testimonies in the filing, here.